is an English group from 1960s famous for their coarse bluesy rock sound with R&B textures. 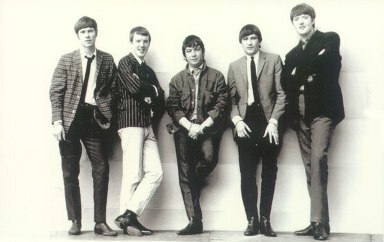 Part of the British Invasion, there were many incarnations of the group before emerging as a proponent of the psychedelic rock era. They were only around a few short years before disbanding. However, over time there’s been several reunions of the original group. In recent years Burdon and original drummer John Steel have toured with new versions of The Animals as Eric Burdon & the Animals and Animals & Friends respectively. What’s the correlation of The Animals and Hendrix some of you may ask? Well, original bass player Chas Chandler when he left the group went on to become Hendrix’s manager and recruited Noel Redding and Mitch Mitchell to form The Jimi Hendrix Experience. Chandler also produced Hendrix’s first two albums and was also responsible for introducing him to Eric Clapton. This is the famous meeting where Hendrix got a chance to play with Clapton and Cream. As we all continue to juggle our day to day responsibilities, there are always challenges we have to face. But it’s the music that helps many of us with the curves life can toss. There is no better therapy in my mind! How many of you have disruptive insensitive neighbors? Do you have a theme song that comes to mind when you’re under the weather and still have to deal with ridiculous people? I love this song! My husband’s band does a cover of it and it is just as rowdy as the Animals were. Seems funny to see them in suits and short hair — the music just doesn’t match. do you remember The Pretty Things? I get sorta bummed when I don’t feel good. A warm summers eve. herbly inhanced 1970-71 by a lake . As the sun goes down and the quite of the eve. sets in ” A warm SanFrancisco night “, playing . One of my best memories of early adulthood. This may not be my era, but I love songs from the 60s. This one is no exception. The chorus and bass line are my favorite parts. I love how recognizable it is, and I feel you on remember a bass line. Thanks for posting this song it’s great! I’m a keyboard player and was 18 when House of the Rising Sun was released in 1964, and I remember playing it with my college band. My current band plays It’s My Life. The Animals, despite their short life, had a big impact on popular music. Dang me, but I don’t remember them looking so young. Thanks for the walk down memory lane. Sorry you feeling out of sorts. Get better. As for the neighbors, get moving on that Saturday morning gig and be sure to invite a lot of rowdy friends. I am 56 and played the guitar years back & always played “The House of the Rising Sun.” Animals were one of my favorite groups and never forget the feeling I had when I first heard this song and others by them; just put me in a special place mentally. Hope you don’t let neighbors bother you; life is too short! You turned your thoughts to music and that always helps me too. Good thinking! The Pretty Things – great band. I think that if they’d had the same PR as The Rolling Stones and The Beatles, their commercial success would have been comparable as well. One of the great things about their back catalog is how the music changed over the years. For anyone who isn’t familiar with them, run a search and check them out. You’ll be glad you did.